I don't like yer mug. Bluth Company: Fox made this available on their web site early in the third season of Arrested Development, just as Michael Bluth began sipping from one at his desk on the show. Remember an easy way to build on your prop budget is to develop merchandise that works on screen as part of the show. Even so, I don't think there're too many of these around. Oceanic Airlines: This belongs to the airline from Lost, and like the Bluth mug above, appealed to me as a prop replica. If it's something a character on the show would hold, I usually want one. 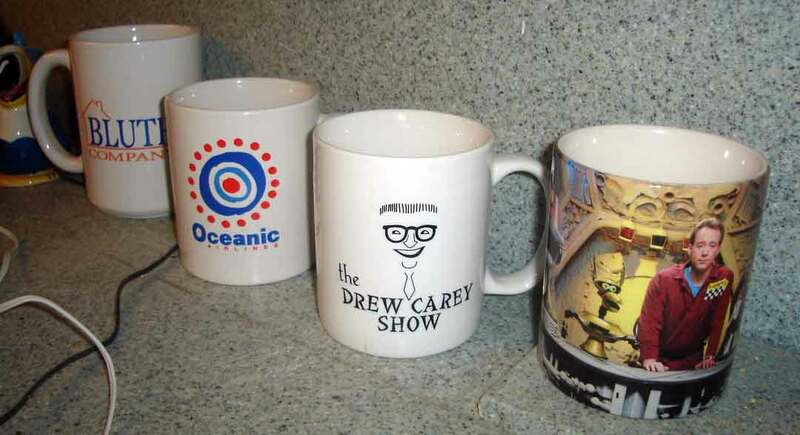 Drew Carey: This, on the other hand, appears to be a cast and crew gift, meaning there are very few around. Found it in a Salvation Army store in Pasadena. MST3K: I inherited 2 Mystery Science mugs, one with Mike and one with Joel. Interesting, and just meaningful enough to hang around. Oh - and Happy New Year! Hoping 2011 is a considerable improvement over 2010; it's already looking like an improvement.